Reg pulled in to check out the The Mill Casino RV Park in Coos Bay, and since we were there, I couldn’t resist trying my luck. I waved goodbye to my five dollar bill as I fed it into a giant slot machine…then pushed the button. Much to my surprise, I walked away with a $20.00 profit. I was thrilled! Maybe we’ll go back and see Elvis this weekend! When smoke continued to choke the Rogue Valley last week, we decided it was time to live dangerously. 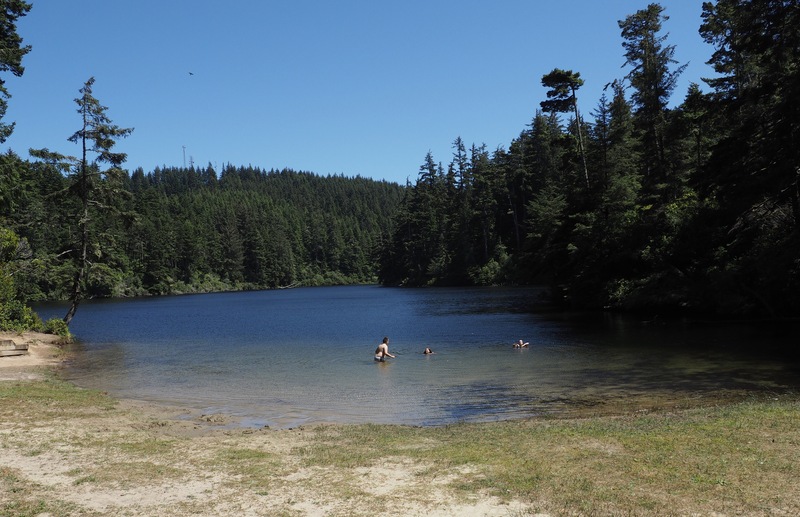 We hitched up our trailer and headed to the Oregon Coast…without reservations! Spontaneous and risky! And successful. Arriving early on the last day of a three-day holiday weekend allowed us to easily find a full hookup spot at a first come – first served campground. Our favorite outing of the week was a trip to the Yaquina Head Lighthouse with friends and fellow campers, Lan and Jeff. Managed by the Bureau of Land Management, the lighthouse has the distinction of being the tallest (at 93 feet) on the Oregon Coast. Free tours of the lighthouse are available most days. Space is limited, so check in at the Interpretive Center to get your tickets. As great as the lighthouse tour was, the stars of the day were the resident gray whales that linger off the coast near Newport from May through October or November. They swim surprisingly close to shore and put on quite a show for us throughout the afternoon. Scanning the water, we were continually rewarded with a glimpses of a water spouts, followed by gracefully arched backs of the diving whales. The sight of a fluke (when the tail sticks straight up) never failed to raise a cheer from spectators. Although the whales were swimming just beyond the rocks, capturing them with my camera lens was impossible…so, while we have no photos, we do have many memories of a beautiful afternoon spent at the Yaquina Head Lighthouse and surrounding Natural Area. We are enjoying a four-day escape from home where work has begun on a new roof for our town home. Longtime friends, Kathy and Doug, drove their trailer up from California, joining us to camp and explore Oregon&apos;s beautiful Coast. We finished dinner just in time to rush down to the beach and catch the setting sun. We are camped at Fort Stevens State Park and have enjoyed exploring an area known for being at the mouth of the Columbia River and the turnaround point for the Lewis and Clark Expedition. Speaking of defense, Fort Stevens was a military installation from the Civil War through World War II, with many batteries, such as the one pictured, standing by to protect the Columbia entrance. Our son Andrew drove from his Portland home to join our expedition that included a walk to the ocean to see the 1906 wreck of the Peter Iredale, which ran aground while looking for the Columbia River mouth. 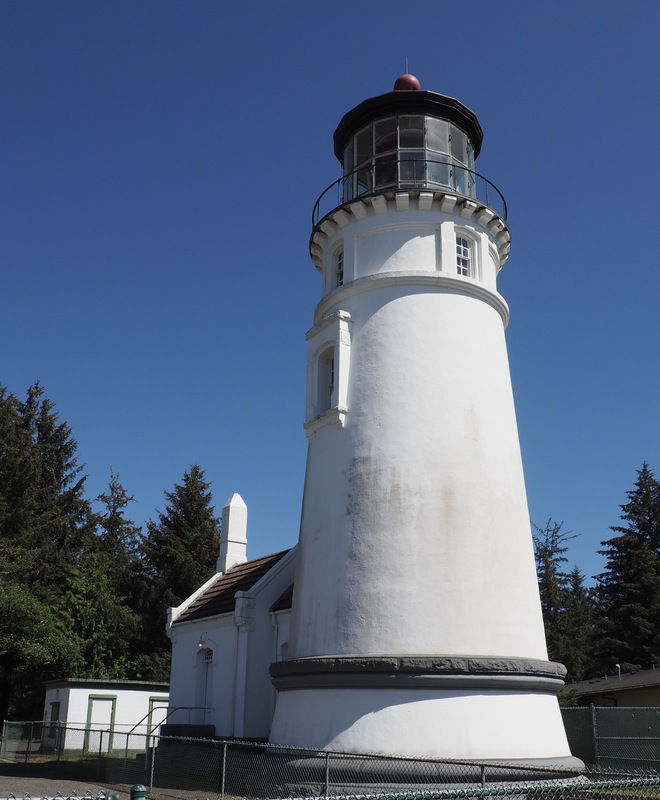 To find where Lewis and Clark first saw the Pacific in 1805, we crossed the Columbia River on a three-mile bridge from Astoria and found the Cape Disappointment Lighthouse in Washington. Our 11-mile roundtrip trek from Cape Disappointment took us through forest where William Clark and his men camped. The cape got its name in 1788 from an English captain who could not find the Columbia River mouth. Disappointing. I’ll say! Some nice ocean views and Waikiki Beach (east!) marked our walk. Our destination was the North Head Lighthouse, which was shrouded with scaffolding while undergoing restoration. While looking for a place to spend the winter, Lewis and Clark canoed across the river to what is now Oregon and quickly built Fort Clatsop, part of Lewis and Clark National Park. We decided to go back by car. The fort is also the site of some family history. We brought Andrew here when he was one year old. Actually, younger sons Brad and Chris were here too, in a much more confined state. …or have we? When Reg reserved our “one night stand” at Umpqua Lighthouse State Park on the coast of Oregon, we both had a pretty clear memory of our prior visit and a mental picture of where we’d be staying as we headed up the Oregon Coast. When Reg pulled into the campground I commented that it was much more forested than I remembered. Without another thought we checked in, quickly set up camp and headed out to explore the ‘hood. 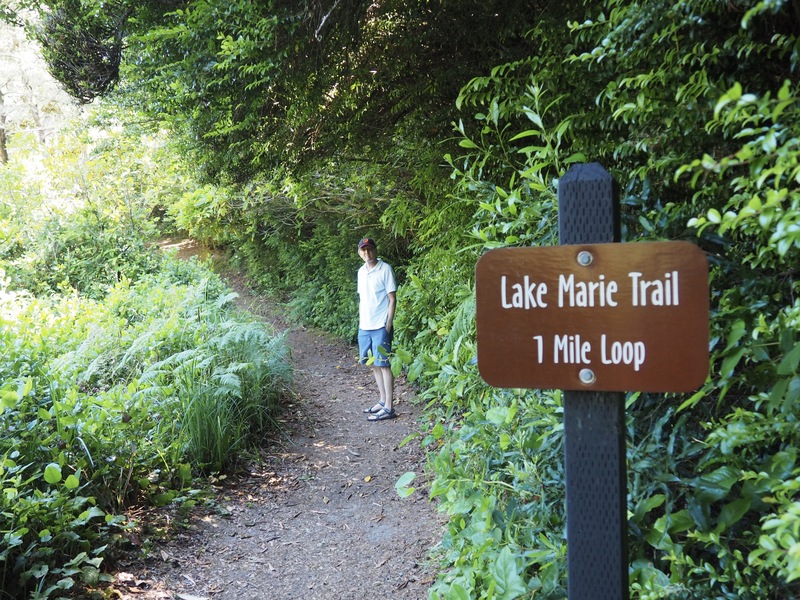 Following a one mile trail that looped around Lake Marie, Reg marveled at our surprise discovery. “I never would have guessed this lake was here,” he said as we watched children splashing in the swimming area. Slightly disoriented, we arrived at the Lighthouse and realized why everything felt so unfamiliar. 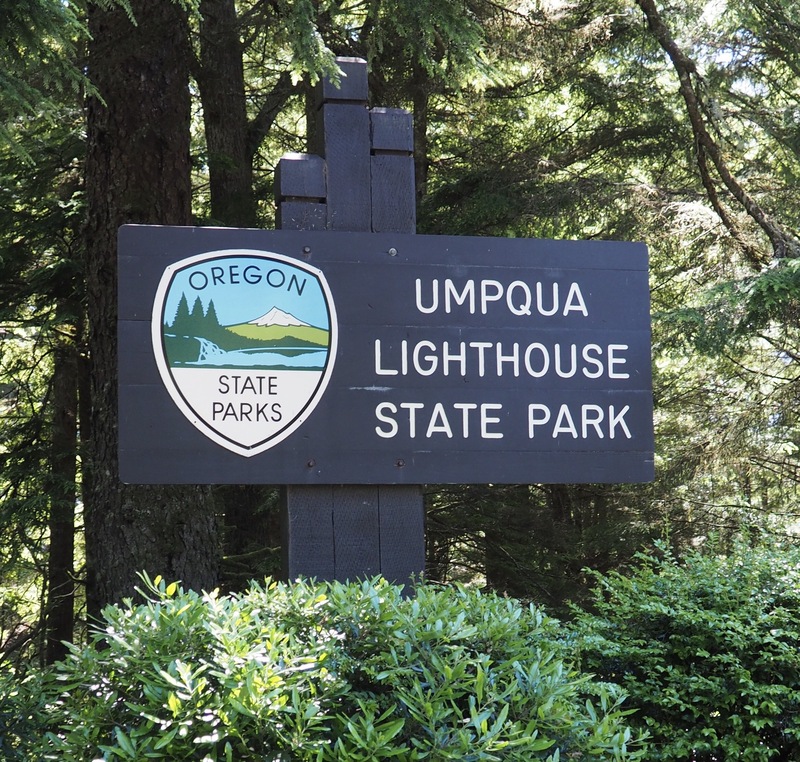 As it turns out, we’ve never been to Umpqua Lighthouse State Park before…until today that is! A chat with a crusty old sea captain type who was selling admissions to the Lighthouse Museum cleared up our confusion, reassuring us that we weren’t completely losing our minds. It seems our memories (and where we thought we had a reservation) are from (we think) Heceta Head Lighthouse, just north of here…where there is no lake and the campsites are not quite so forested! Our lap around the United States took us to 25 states in 61 days, covering 9,833 miles. We spent 58 nights in RV parks, state campgrounds and one federal camp. We stayed three nights in motels when the weather was just too much. The average cost of our RV stays was $39. We paid $11 at a fantastic Corps of Engineers campground and $15 in Bowie, Arizona, which turned out to be one of our favorites. It was quite rustic, but charming. All our camps had at least electric and water hookups; most also had sewer. The high was $70, just outside Charleston, S.C.
Could we have done it cheaper? Sure, but we usually opted for location and convenience, which push the rent higher. Weather. After riding out a tornado warning in Texas, Sue watched the alerts and we stayed away from anything labeled “severe.” That is one reason a few states in the middle are not colored in. We wanted to go up the east coast of Michigan, but winter in May kept us away. Warm (70s and 80s), dry weather, with rare exception, took us east across the southerly route. It got cool and damp in North Carolina and remained that way much of the way home. But, we got some great weather in South Dakota, Montana and Wyoming. So much for the statistics. It was our longest-lasting trip and we are sad to see it end. Sue is especially happy to be home, but we both miss our little trailer. It convinced us that RVing is a great way to see the USA. Overall, trailer life was easier and more fun than we expected. No, our blog has not been hijacked for advertising, that’s how we feel. We learned you can’t see as much as you would think, but you will see much more without a bucket list. We traveled day to day without an itinerary. We drove for a couple of days, then stayed put for up to four days to explore an area without pulling the trailer. The highlight? Spending most of a week with our son Chris and his girlfriend Gail in West Virginia, the hardest place to leave. Surprises galore, but no regrets. Big Bend, New Orleans, the Gulf Coast, Florida, Nashville. Nope, didn’t go there. Chiricahua, Bowie, Saguaro, Warm Springs, north central Indiana. All five stars, just jumped out in front of us! Was it easy? Absolutely not, but the best trips have challenges. Call us crazy, but we think overcoming hardships is part of the joy of travel. Towing a trailer into a hard wind is no fun, but the smell of coffee from your own kitchen each morning is a dividend. So, we have left the road behind, but just for a spell. The Rafter J-Bar Ranch, pictured above, is one of our favorite campgrounds. In the Black Hills of South Dakota, it offers wide-open spaces, every amenity a family could want (except most sites do not offer TV service), in a setting that rivals the best state parks. Custer and his army stayed here in 1874 and it later became a stagecoach stop during the gold rush. Some of the original buildings remain. It later became a working ranch until it was converted to a campground in 1964. For us, it was a nostalgic stop last weekend — we stayed here with our sons in 2001. That was one of our best family trips. Beautiful as advertised: Montana. We entered just north of Sheridan, Wyoming and drove the I-90 corridor across the state. Stunning mountain scenery, forests, rock formations and prairies. There were great views of the snow-capped Bighorn and Rocky mountains. European RVers: In South Dakota, we were suddenly seeing many new Minnie Winnie motor homes, on the road and in RV parks. They seemed to be everywhere, no license plates yet. We found out that Winnebago advertises in Europe for fly-and-drive RV vacations. The renters get the RV for a few weeks at a much-reduced rate and the company gets the motor home delivered to a client. The renters can drive it as much as they want, but agree to deliver it to a city by a certain date. Driving challenges: Driving a motor home or pulling a trailer can be exhausting. You have to choose your stops carefully. Some gas stations and cafe parking lots won’t work. I’ll take a country road, even if it has small-town stops, over a busy interstate anytime. Winds above 15 miles an hour, unless they are pushing you, are not easy. So, we watch the weather. We stayed an extra day once when 40-mph winds were forecast. Is it worth it? We say a resounding “Yes!” When we compare RVing to long motel trips and eating out day after day, this life wins. Our own bed, bathroom, kitchen, food. No living out of suitcases. For us, the benefits far outweigh the driving hassles and work of setting up and taking down at each RV park. Gas costs: Prices were lower once we left the west coast. California was the highest, Texas ($1.98) the lowest. We usually paid about $2.25 a gallon. Also, the cash and credit card prices were the same most of the way. No 10-cent charge for using credit. Car brands: Once we left the west coast, we saw far fewer Priuses and Subarus. Flags: We saw the Confederate flag frequently in the South. Today we wound our way out of the Black Hills of South Dakota, snuck through a corner of Wyoming and arrived in Montana – Big Sky Country. The gently rolling hills of Montana’s eastern plains seem to stretch on forever…and so does the sky above them. It seems like spring has been late arriving in the northern part on the United States. Although landscapes have been green and lush, trees have continually been bare of leaves. That just made it all the more exciting to stumble upon these wildflowers blooming on the hillside behind our campground. Montana is a new state for both of us, and we are eager to discover what adventures lie beneath this “Big Sky.” Plenty of time for that tomorrow! The drive to Mount Rushmore National Memorial gives visitors several frames for one of the world’s most spectacular engineering achievements. When you steer along Iron Mountain Road, go counterclockwise if you want the four presidents in your windshield. The 17-mile road was designed to connect three one-lane tunnels blasted in the rock. It features 314 curves, 14 switchbacks and three pigtails. Sculptor Gutzon Borglum’s presidents measure 250 feet across and each head is 60 feet tall. Why were these four chosen? George Washington, for leading the struggle for independence. Thomas Jefferson, the idea of government by the people. Abraham Lincoln, ideas on equality and the permanent union of the states. Theodore Roosevelt, the emerging role of the U.S. in world affairs. On our way to see the four stone heads, we explored the 71,000-acre Custer State Park. This place alone would be worth a visit to South Dakota’s Black Hills. We walked around Legion Lake, one of several lakes in the park, then picnicked next to a creek. We began our day by hiking to Cathedral Spires, one of the park’s many treks that vary in length and degree of difficulty. They share a location as beautiful as any we have seen on our journey, which is nearing 8,000 miles.